...what the next big "style" will be well before it actually happens, and along those lines I thought one easy way to figure out what's going to be next is to look at late Le Corbusier designs and then take them a step further. I immediately thought of the Olivetti project and these wild curvy wiggly office towers, and even then crashing them together. Moreover, the way that Olivetti is on a raised "terrain", I thought of easily creating a "terrain" out of pieces of the Media base model, and then having that raised on pilotis. The imaginative designs on this theme alone are boundless. ...in AREA 00:02 there is a new wavy, bottom undulating project by MVRDV. 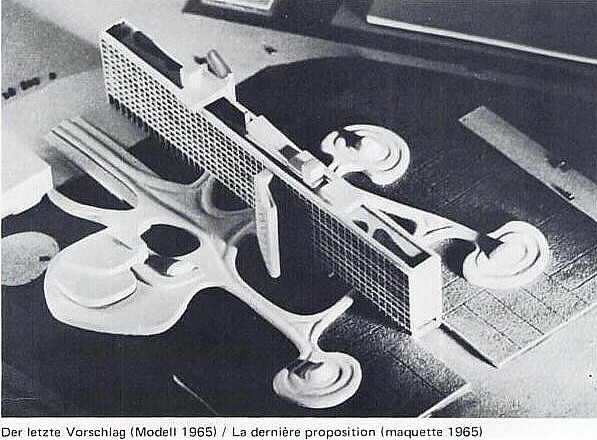 I liked the project, I see both Le Corbusier's Olivetti project and OMA's Algiers hotel, plus it reminded me of the undulating plane question I posed to Sarah Whiting at Inside Density. 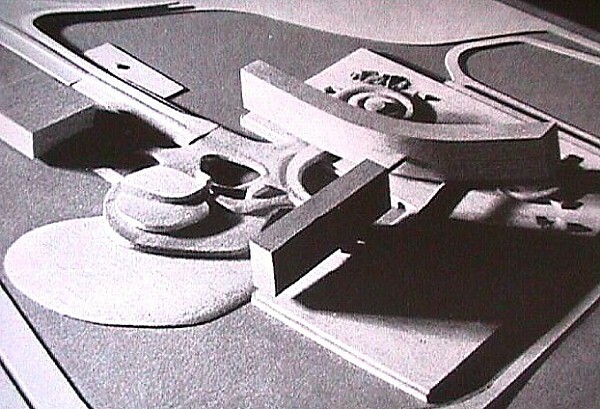 Pablo Allard, "Bridge over Venice" in Le Corbusier's Venice Hospital, p. 22. *Le Corbusier quoted by Jullian in conversation with author; Charlestown, Massachusetts, 2001. ...Le Corbusier's design for the Electronic Calculation Center Olivetti, Rho-Milan, 1963-64--it's got mat, blob and funky hi-rise all in one. 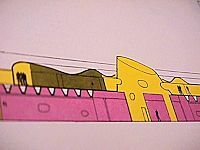 The first to reenact this one was Stirling with his unbuilt design for the Olivetti Headquarters, Milton Keynes, 1971. 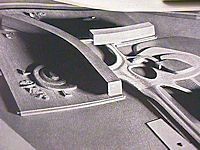 Though it's hard to discern from the model and plans of the 'cafeteria' facilities of the Olivetti center, there is a definite free-flow circulation between levels which is a strong 'blob' characteristic. ...just 'reenacting' Le Corbusier. See Le Corbusier 1957-65 pages 116-129 for the 'origin'. I listened to most of the lecture while doing other work. Interesting, and likely even fruitful, typological analysis in terms of forms and how they may relate to programs and usage, but there remains the hint of force-fit and an even horizontal shift from 'iconic' analysis/design to 'political' analysis/design. As to this work's place within the continuum, I like how Le Corbusier's Electronic Calculation Center Olivetti is now being reenacted. I'm using "reenactionary" more in terms of how ZP's designs 'reenact' the mat/box/blob paradigm of Le Corbusier's Electronic Calculation Center Olivetti at Rho-Milan. Although intrigued by ZP's 'new politics of the envelope' I'm not sure 'politics' is the right word to describe what it's really about, but it might just be right. ZP notes how in the past it was in the plan where 'politics' was found, whereas he now see the politics in the envelope, and there seems to be something to that. Just recently I looked closely at the plan of the Palace of Versailles (when I was also reading ZP's essay in Log), and besides the political implication of the King's Bedroom on axis in the center, the similarity in plan of the Chapel and the Opera off to the side respectively got me thinking not just of their relative marginal positions, but how both plans represent 'theaters'. Anyway, if ZP's politics of the envelope can operate/communicate in the same type of way, it seems that would make for a novel/fecund design methodology. When AZP writes "or to explain the breakdown of the correlation between interior and exterior and private and public, are legitimate poltical performances," it only seems fair to include UN Studio's work. I mentioned UN Studio's Yokohama terminal project because "the organizing principle of the terminal is the structural association of architecture to infrastructure and landscape; garden-like voids are absorbed into the architecture and then proceed to transform it" and one of the section drawings calls out a 'climatic facade system'. Further reading reveals some strangeness, however. 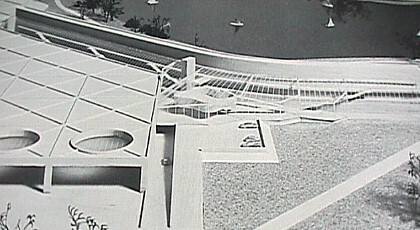 "This design-by-section represents one of our first, incomplete, experiments with 4-D architecture. The building itself was never designed, but 30 sections were worked out, after which 3-D Studio was used to fill in what was left." "Finally a photo-shopped skin was wrapped around the resulting composition in order to simulate the appearance of a building." Politics of the envelope indeed? First stage: main entrance with restaurants, library and other social facilities, then the first sguare workshop block measuring 350 ft. x 350 ft. Above this block are ten storeys of research laboratories. The assembly shops are at ground level. The entrances, however, are located at roof level. By means of an entrance ramp the employees reach the connecting corridors which lead to the three [amoebae]-shaped locker and washroom blocks. One enters the various shops at ground level by means of stairways. The workrooms receive well-distributed daylight from above; there is also a plantation on the roof and a sprinkler system which provides cooling during hot weather. 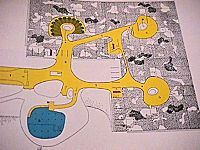 Again AZP: "...certain manipulations of the ground and the roof indicate the politicization of nature."